Dril-Quip's SS-15 BigBore II Subsea Wellhead Systems allow an additional casing string, casing hanger and seal assembly (typically 18") to pass through the 18-3/4" wellhead with the BOP stack and riser in place. This accommodates drilling and running large bore diameter casing string through pressurized water sands with complete BOP control and with all returns back to the drilling vessel. The illustration to the right shows a 36" x 26" x 22" x 18" x 16" x 13-5/8" x 9-7/8" casing program. The SS-15 BigBore II Subsea Wellhead is designed for 15,000 psi working pressure and H2S service. The wellhead has a primary landing shoulder and unique multiple-load profile on the lower I.D., which allows all casing weight and pressure loads to be carried at the bottom of the wellhead, with a 7.0 million lb load capacity. The wellhead-restricted I.D. is 18.510 inches. The lower O.D. of the wellhead has a reaction ring to transfer bending loads to the conductor wellhead for maximum resistance to bending. The wellhead can be provided with a Dril-Quip or customer-specified wellhead connector profile. The SS-15 BigBore II 18-3/4" standard wellhead is a nominal 27" O.D. The SS-15ES BigBore II 18-3/4" wellhead has a nominal 30" O.D. All BigBore II 18-3/4" wellheads can safely pass 18" O.D. pipe with flush O.D. connections through an 18.510" minimum I.D. 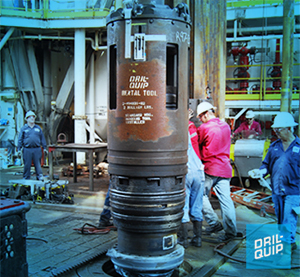 Contact your Dril-Quip representative for more information about the SS-15 BigBore II Subsea Wellhead Systems.